The historical financials paint the picture of a solid, but not a spectacular business. The quality of their reported earnings seems to be fine based on how much is converted to cash flow. The FCF for the TTM doesn’t look good, but I think it’s probably a positive. The low free cash flow is mainly caused by increased investments in working capital (inventory and account receivables) due to higher sales and projects picking up pace. Unfortunately the gross margin is down significantly compared to last year, but not outside the historical range. No immediate reason for panic. What’s also positive is that the company has been paying a decent dividend that averages 33% of net income. I think they could return a bit more money to shareholders given how much cash they have, but you can also see in the recent results how quickly cash can disappear when more working capital is required. The family probably prefers to finance the business conservatively and keeping some cash on hand is totally fine with me. The valuation of a stable manufacturing company is straightforward, and the main question is what you think the cost of capital of this firm should be. I think something around 10% is reasonable, maybe a bit more, which would imply the firm is worth approximately 10 times earnings plus the value of the non operating assets. Net income for the TTM is 9.7M SGD while the 7 year average is 9.1M SGD. This would imply a valuation around 130M SGD, or almost two times the current market cap. Nam Lee Pressed Metal was founded by the Yong family in 1975 and three of six members of the board are family members who have been with the company since it’s inception. 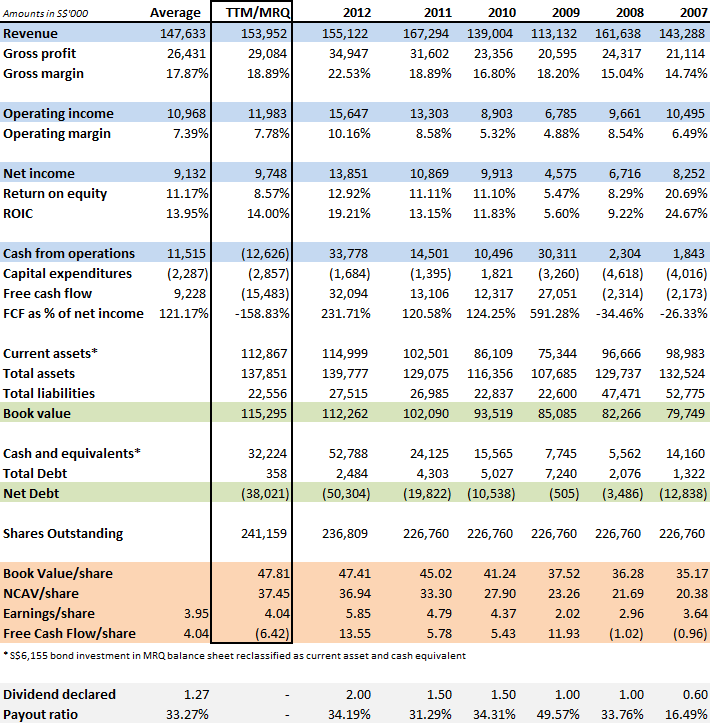 The family still owns almost 60% of the stock and they appear to be shareholder friendly by paying out a decent percentage of income as dividends. It’s of course a question what the company is exactly going to do with the large amount of cash on the balance sheet, but insiders certainly have the right incentive given how much of the company they own. What’s a slight positive is that the high cash balance is a recent phenomenon. A major customer accounts for a substantial portion of our revenue. We are therefore dependent, to certain extent, on this major customer, as any cancellation of its sales and purchases would have an impact on our operations. Although we have long-term contract with our major customer, it may alter its present arrangements with us to our disadvantage, which would in turn have an impact on our operating income, business and financial position and consequently, our operating profits may, to a material extent, be adversely affected. In the current financial year, revenue from two major customers amounted to $89 million (2011: $114 million) arising from sales by the aluminium segment and $11 million (2011: $15 million) arising from sales by the aluminium and mild steel segments respectively. Being dependent on one customer for a big part of your revenue is a major risk risk, but the company does have a few things going for it. It has a long relation with this customer, so apparently both parties are happy with the status quo. The oldest annual report I could find online was from 2008 and since then nothing has really changed. Nam Lee is also the only worldwide third-party manufacturer of aluminium frames that is used by this customer. It’s not the only supplier, but the other suppliers are related parties that are located in the US. Nam Lee Pressed Metal Industries is a boring but solid business. Their customer concentration is the only major risk factor I see, but given the amount of cash on the balance sheet the downside is somewhat limited. I also think that there is no real reason to believe that this will become a problem anytime soon given how it hasn’t been a problem in the past. In the end this idea is very similar to the earlier discussed Spindex Industries: both are cash rich businesses with high insider ownership, decent returns on equity and a nice dividend yield. If I would have a lot of cash laying around I would probably buy some shares. This entry was posted in Research and tagged G0I.SI on October 4, 2013 by Alpha Vulture. After you did the post on Spindex I looked through some stuff on the Singapore market and ended up buying Nam Lee. This is my favorite kind of investment. They have been around a long time, they do something simple, they have a super strong balance sheet, and they are cheap. Find anything else that fits that bill? I saw some stuff that looked cheap, but a lot of them tend to have a lot of chinese operations, and I am afraid maybe those operations don’t really exist. I may look through it again to see if anything pops out though. Jason Marine seems solid and cheap too.